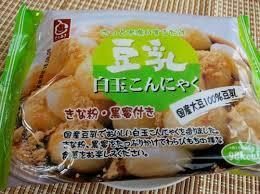 This is a shiratama konjac produced by adding konjac powder to soy milk. Even including all the brown sugar sauce and kinako powder, it is only 98kcal. It is a very low calorie Japanese style sweet. Take out the cold konjac from the bag, wash it with water and serve it on a plate. Add brown sugar sauce and kinako powder and enjoy. You may also mix it with yoghurt.